Salut old friends and new!!! Read more for pix, reviews, info & raves of my favorite "QUALIFFORDABLE" cosmetic brands! 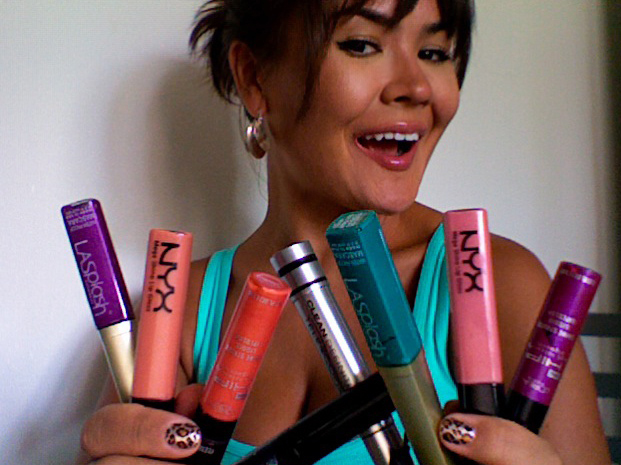 Why I love NYX: Pigmentation, pigmentation, pigmentation!!! Also, staying power, color range, great packaging, and of course--affordability! I can't rave enough about the jumbo eye pencils... these babies are amazing for anything eye makeup related. Use them as bases for shadows or alone for a quick burst of color that will stay put all day--yay!!! NYX eyeshadow base has replaced my all time winner Urban Decay primer potion and that's saying a lot! 2. L'Oréal--stands the test of time. This brand is available anywhere and everywhere: from large retailers to supermarkets to beauty supply stores. L'Oréal is the only brand I choose for mascaras and its HIP collection offers pigmented eyeshadows and lip products at great prices. Why I love L'Oréal: Bottom line--I simply trust this brand. The mascaras are the best out there (by far) and for about $10 each, I can basically afford to wear them every day and not feel guilty about going through them like they're food. Voila! 3. LA Splash for color mascaras. I'm a sucker for bright, bold, in your face lashes and because these pop mascaras are only $6-7, I now own every single color!!! 4. Rimmel for lipsticks and some eyeshadows. This is for all you Londoners out there... London-town's own Rimmel is my go-to for QUALIFFORDABLE lipsticks! As you can see, I use this eyeshadow quad quite often. I love the consistency of the shadows: the colors are easily "blendable" and perfect for every day use. that pink lippie is gorgeous and sooo shiny! great post! I love the NYX glosses...despite the fake cherry smell! the eye make u in the last pic is so amazing , looks great with your eye color ! I need some NYX products! this is really helpful! thanks! Great collections hun..Absolutely love all of them..Gorgeous colours for sure..^_^..
thanks ladies, i'm so glad you all like my qualiffordable choices!!! Great post!! NYX is awesome. I need to build up a NYX collection hehe. You can rock any "look" that last picture of you is so pretty! Adoro essa marca NYX!! Tenho alguns produtos!! wow this is great. i dont own too many NYX things but the products i do have i've liked so might look into getting more of it :) great post! Wow great post. 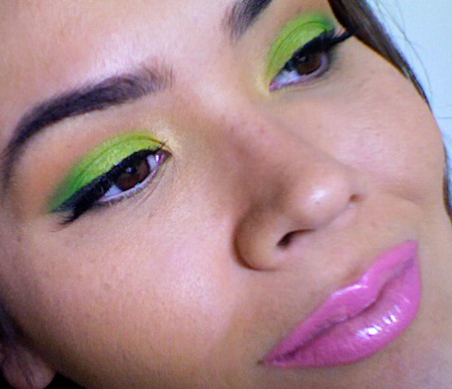 I love NYX and LA Splash products! You've really got some of my drugstore favorites here! I love the stuff!!! NYX is great! and your pic at the end is so cute!! Thanks for the post. I can't wait to try NYX eye shadow base. I am convince. Thanks for the recommendation. Great post! I quite agree with you :) I love Rimmel, L'Oreal and Nyx. I like Rimmel because its so affordable! Great post! I agree with you on LOreal, it's affordable, available, and awesome!